Although it has become fashionable and commonplace to describe the appropriation of Native American, African, and other traditional arts by European modernists, very little has been said about the appropriation and uses of modernism by non-Western artists. 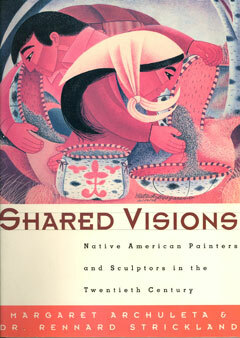 Now, Shared Visions, based on an exhibition prepared by the Heard Museum in Phoenix, Arizona, presents more than seventy Native American painters and sculptors whose work draws on Euro-American conceptions of art as much as it does on Native American traditions. The Native American Fine Art Movement has spanned this century, and the range of works represented here in full-color reproductions is impressive—narrative and abstract painting, collages, installations, and sculpture. With fascinating essays by the exhibition organizers, Margaret Archuleta and Rennard Strickland, as well as by Joy L. Gritton and W. Jackson Rushing, and with over 130 reproductions—76 in color—Shared Visions is an excellent introduction to one of America’s most important art movements.